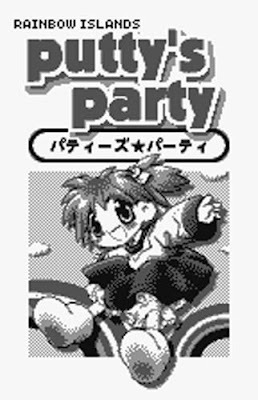 * Less damning than the above, but still plenty relevant to this conversation: a company called MegaHouse published Putty's Party (in 2000). The only other games it helped bring to the masses are another WonderSwan game (Tetsujin 28-gou) and a trio of fairly random, Japan-only DS titles. * Unlike basically every other Rainbow Islands game around, Putty's Party is rendered in black, white and a few shades of gray. * As far as I'm aware, Putty's Party doesn't include all 10 of the arcade original's islands. Sorry for that last "as far as I'm aware" bit, but up 'til now I've only been able to complete the game's first four islands (Darius, Doh's, Insect and Monster)--which, intriguingly, can be tackled in any order. Unfortunately, simply finishing those islands doesn't cause any new ones to appear. My gut tells me more are revealed if you manage to nab all seven collectible diamonds on each of the initial isles, but I can't say that with any certainty since I've yet to accomplish that far-from-simple feat. As for what I think of the stages I have experienced, well, let's start with a positive impression. An obvious one is that Rainbow Islands: Putty's Party is played with the WonderSwan system held sideways, so its screen is oriented vertically. That may sound gimmicky, but it's not. 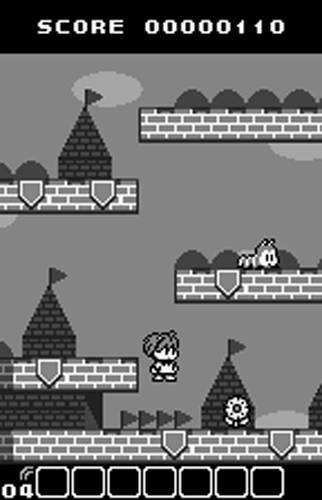 In this game, as in others made for Bandai's would-be GameBoy competitor, it lets you see quite a bit more of the playfield than you would if everything were depicted horizontally. One caveat I've got to add to the above: the protagonist Putty's sprite isn't quite up to snuff, in my opinion. Another component of Putty's Party that disappoints, at least at first, is its controls. I've always thought the arcade original seemed kind of stiff, especially while executing jumps, but this WonderSwan version feels even more rigid. It's also noticeably slower than its quarter-munching predecessor, which is sure to increase the annoyance felt by some players. Here's the thing, though: after a while, and after accepting its existence, the stiff slowness of Putty's Party stopped bothering me. That's not to say I now "like" it, mind you, but I also don't hate it to the point of wanting to smash my WonderSwan Color to smithereens, so I'll call it a wash, if not exactly a plus. I've also come around to another of this port's quirks--that being how the third (of four) level of each island offers up gameplay that's subtly and strangely different from what Rainbow Islands veterans are used to encountering. For example, water starts flooding Insect Island's third stage basically from the word go, adding an element of tension that usually only pops up if you dillydally or otherwise take too long to reach an area's summit. Although curious, I wouldn't describe either of these additions as entirely welcome. Still, they provide a unique take on Rainbow Islands' traditional gameplay, so I it's hard to discount them completely. 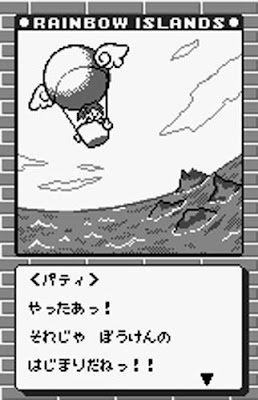 That said, if you've, say, spent time with Nintendo's Ice Climber and it didn't cause you to put a controller through a wall, and if you aren't horrified by the idea of a colorless Rainbow Islands, you could do worse than add Putty's Party to your WonderSwan collection.